While surrounded by brand new apartments and office buildings, this urban rooftop retreat is not located downtown. It’s in a shopping mall. A very nice one, along with the new Archer Hotel, that features one of my photos. However, this is not from the hotel, it’s actually from the rooftop of an impressive and upscale furniture store. I was there at The Domain Northside this afternoon with my wife, taking in a pristine downtown like development on a pleasant spring day. I’ve mentioned often that Austin is growing rapidly. While the increased traffic and rising prices are the negatives of growth, the positives include substantial and more sophisticated developments — ones nice enough to siphon off people from the growing downtown. The Domain Northside seems promising with pedestrian activity giving a nice sense of vibrancy. While not inexpensive, it beats the sky-high prices of downtown and its downsides. While still a mall, which ultimately doesn’t compare civically with a real downtown, these developments do a pretty good job. Certainly, it beats the typical strip malls and giant indoor regional malls, surrounded by acres of black asphalt parking. These apartments also are a far cry from the typical three-story disposable wooden structures that dominated Austin, not too long ago. It used to be called Restoration Hardware, which sold a mix of fun gifts, tool and decorations. Over time, they’ve transitioned more into home furnishings. Now that transition is complete. 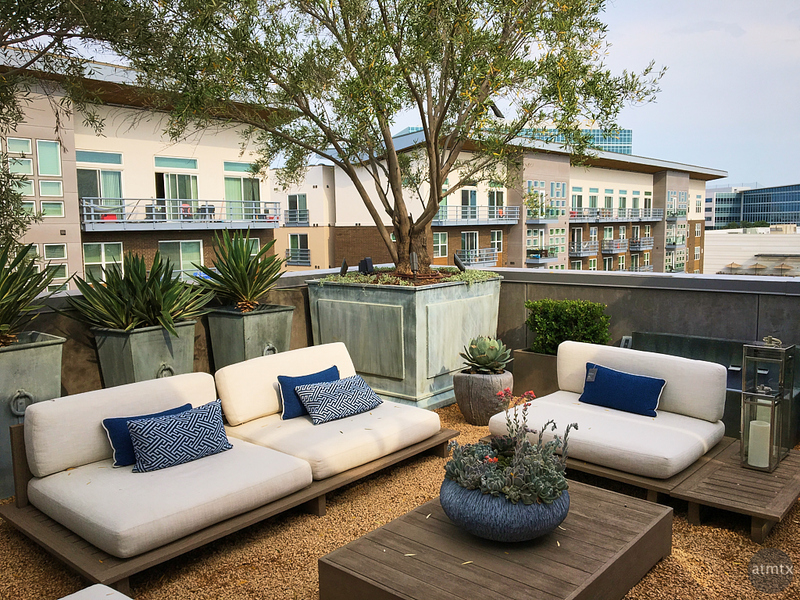 They are known simply as “RH” and this new Austin store is four stories of upscale and oversized furniture. It’s beautiful stuff with equally beautifully expensive prices. It was fun to look, and dream. But the chunky pieces that looks so good in the showroom, seem overly large for the typical house. I shot this with my iPhone from the fourth floor rooftop showroom, featuring outdoor furniture. It’s an impressive space rivaling any upscale restaurant. Just add drinks and maybe some finger food and I would’ve stayed there for hours. It was a perfect mid 80’s day with the sun burning off the earlier humidity from the morning rains. Everyone in Austin knows the heat is coming, but we’re enjoying our last days before the onslaught. Great iPhone shot. I could see that in Austin Monthly or other such publications. Thank you, Mike. In good light, the iPhone does so well for these type of shots. Smartphones have come a long way.